Scroll down to see a few of our favorites. All items shown are in stock unless noted. Can't make it in, call us and we will ship for you. Alexander & Co. Posters Fully customizable for you! Mud Pie gold cheers bottle opener. Custom glasses. PSA personalized stampers for all the mail the new couple will be sending out. 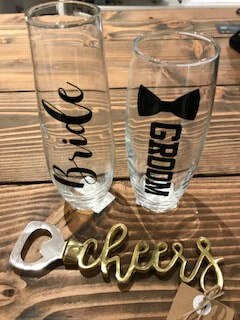 Beautiful toasting pilsners, hand etched and decorated with Swarovski crystals, also available in champagne flutes, wine glasses, shot glasses and old fashion glasses. 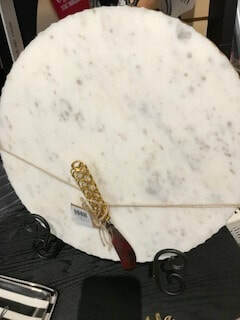 Sold as a single glass or set. Prevent cold feet with 'I am the bride'® white low-cut w/ pink words and 'I am the groom'® - white low-cut socks with 'tuxedo-black' words. Alternative Guest Book. Wood frame and hearts. Display on a table or hang on wall to enjoy.